Puccini's “Madame Butterfly” is one of the cruelest stories ever told. In 19th century Japan, an American Navy officer named Pinkerton marries a 15-year-old girl named Cio-Cio-San, never intending to take his vows seriously. He leaves this Butterfly behind, promising to return. When he does finally return, it is to discover his bride has borne him a child. The officer has in the meantime married “a real American bride,” and visits Butterfly *with his new wife* so that they can take her child from her and raise him as an American. *And* Pinkerton gets to sing a sad song at the end. This is such heartlessness that my eyes are more likely to well up with anger than with the sorrow, which is the approved emotion while attending “Madame Butterfly.” I would like, just once, to hear Pinkerton's toadying friend clear his throat and ask, “Ah, excuse me, old man, but wouldn't it be rather easier on Butterfly if you left your new wife behind on the ship?” The moral imbalance in the opera is so extreme that it provides a way to measure racial attitudes, for there was once a time when some audiences felt sorry for Butterfly, yes, but felt that Pinkerton was, after all, really only doing the right thing. 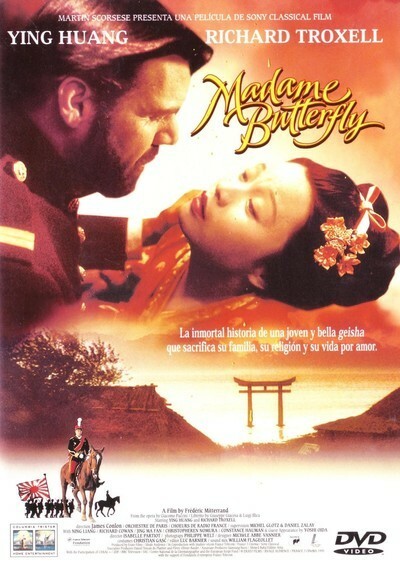 This beautiful new film version of “Madame Butterfly” is not a revisionist approach; it films Puccini's opera more or less as it was intended to be seen, and of course that is what we want (I am not looking forward to the Baz Luhrmann version, with Pinkerton as the leader of a motorcycle gang, and Butterfly as the daughter of a Korean grocer in the Bronx). The approach is traditional, the pace is attentive, and yet the emotion is still all there, and when Pinkerton's carriage comes rolling up with his new family inside, my blood boils. The key casting decision is Butterfly, and the filmmakers have discovered a new face for Cio-Cio-San, a 27-year-old Chinese singer named Ying Huang. She has said in interviews that she will never sing the role on the stage, because her voice is not big enough, but in the intimate spaces of this film, it fills all the corners. She may not look 15, but she does look young and defenseless, and as the depth of Pinkerton's betrayal sinks in, she exhibits true pathos. Pinkerton is played by another newcomer, Richard Troxell, who made his professional debut only in 1993. His voice is splendid and his manner assured, and he does not betray by one flick of an eyelid what a monster Pinkerton is. That is the correct approach, I suppose; one tiny glimmer of insight, and Pinkerton is lost. Films of operas have two avenues open to them: Cast for the voices, or cast for the faces. There must almost always be a compromise in one direction or the other. There is a stage performance of “Butterfly” on laserdisc starring a soprano who has a magnificent voice but is old enough to be Butterfly's grandmother. Watching the disc, I don't care; she is a superb actress, and once I accept that I am watching a stage performance of great music, Puccini sweeps all quibbles aside. This “Butterfly,” however, is essentially a film, and benefits from Ying Huang's fresh face and manner. She has several moving scenes with her servant, Suzuki (Ning Liang), also well-cast, and it's touching to see doubt creeping into her eyes as Suzuki asks, “Have you ever heard of a foreign husband returning?” The film has been directed by Frederic Mitterrand (nephew of the late French president), who intercuts his crisp color photography with newsreels of the U.S. fleet visiting Japan around the turn of the century. He uses shots of the Stars and Stripes, and Puccini's sly quotations from “The Star-Spangled Banner,” to set up an ironic contrast between Butterfly's trust in America and Pinkerton's betrayal of that faith. And of course there are the great sorrowful arias that have become among the most familiar of all operatic music. From the narrow point of view of its musical quality, this is not at the level you would find in a first-class opera house. But as a treatment of the story, as an evocation of the emotions of love and the wound of betrayal, it is close to Puccini's intentions, and very moving.